At one point in the second quarter, it looked like a young DC Presidents side might give their North East rivals Gateshead a black eye in the first derby of the year. DC running back Matt Caley had just run in from short range, and former Senator Matt Long had hauled in the two-pointer to make it 20-6. Gateshead were giving up costly yards on penalties, and had just had a player ejected. Then the Senators unleashed Evander Harewood. Evander Harewood (#22) carries the ball for the Gateshead offence. Picture courtesy of Durham Photography. The young running back tore through the Presidents for five rushing touchdowns and threw for another, as the Senators scored 34 unanswered points to win 40-20. The victory took Gateshead to the top of the National North division, and ended DC's unbeaten start to the year. This game had tension by the bucketload. 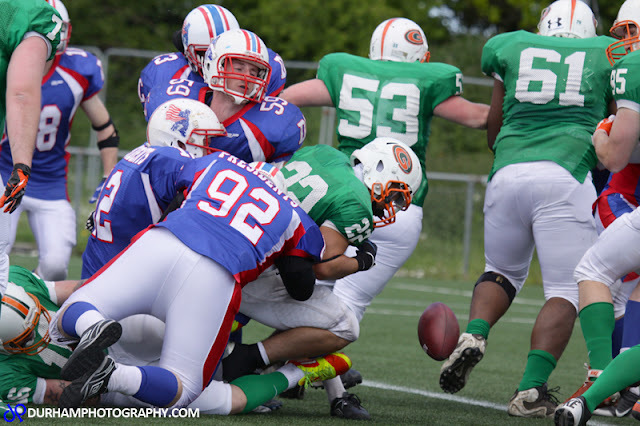 Gateshead were the established team with a mean defense, eyeing a run for the playoffs. DC were the new boys, and had attracted a few former Senators to a set-up led by new coach Ben Johnson. As with many derbies, it looked early on like the game might be swung by mistakes or penalties. The teams traded punts early, but Gateshead got a break early on when a DC player failed to haul in a booming kick, allowing them to claim the ball with great field position. After a few plays - including a 4th down QB sneak by Lee Fraser - Harewood leaped over the pile from about a foot out for the first score. On the next drive, DC improbably kept possession when Gateshead blocked their punt and it squirted forward straight to a DC player. Then Gateshead's Mikey Rumney lost his cool, drawing his a second unsportsmanlike conduct penalty and getting thrown from the game. The 15-yard flag put DC around the 30, and they got close enough to convert a Danny Bomken field goal. DC got even closer before the quarter was out, hauling Lee Fraser down in the end zone for a safety to make it 6-5. And they took the lead at the start of the second, as Jonathan Bateman found one-time Senator Josh Pratt wide open up the middle for 12-6. DC started having some joy on the ground through Matt Caley and Ollie Manning, but it was Gateshead who were handing them the most crucial yards. A personal foul penalty was immediately followed by two 15-yard flags on one play, where a harsh helmet-to-helmet call on Christian Addison got a loud - and costly - response from the sidelines. DC then gave up consecutive holding penalties, but throws to Al Whitehead and Ollie Manning put them back into range for Caley to score. 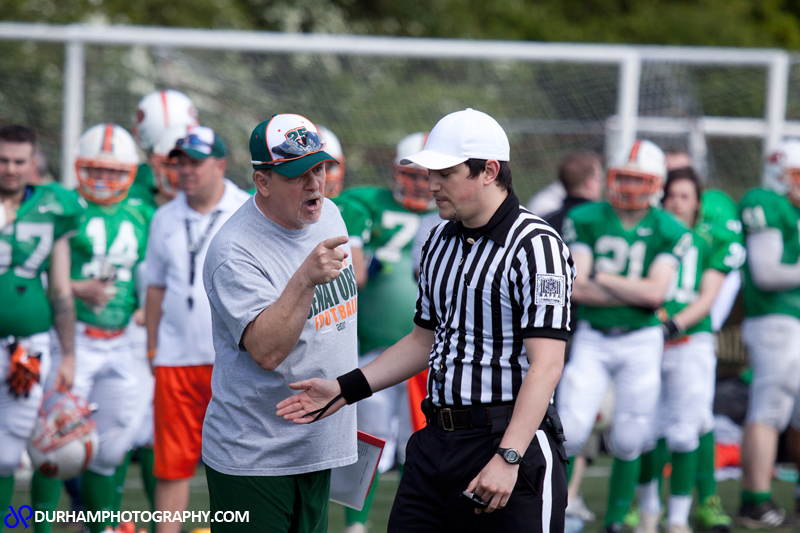 Head Coach Gary Marshall having a 'calm' discussion with the ref. Picture courtesy of Durham Photography. Gateshead responded quickly, with a long return from Jon Thompson (no, not that one). Then DC gave up 30-yards of flags in one play too, and Harewood finished the job with a 20 yard dash. They had a late chance to end the half ahead, but Fraser was picked off in the endzone by Danial Westmoreland. Due to a Lee Fraser injury, the Senators were increasingly running out of a "beast" formation, and Harewood was worrying the DC defence. Long runs took them inside the 10, where Rob Campbell hauled in an excellent catch from Harewood on 4th down. With momentum turning in favour of Gateshead, the game's low point came with a nasty injury to Senators stalwart Ross Elliott, who was removed on a stretcher after breaking his tibia and fibula and dislocating his ankle. However, he was cheering from the sidelines within a couple of minutes when Harewood powered in for the go-ahead touchdown. At this point, the Senators were motivated, galvanised and in control. Jon Thompson picked off DC shortly after, and Harewood added another with a short run through the Presidents line. DC tried to eat into the Senators lead, but turned the ball over on downs inside the red zone. From there, Harewood wrapped it up with a blistering 85-yard dash to the house, and would have added an even longer one on the next drive if it hadn't been called back for a late block in the back. Harewood didn't have it all his own way, as the Presidents defence forced a fumble. Picture courtesy of Durham Photography. The 40-20 win puts Gateshead in the driver's seat with a 3-0-1 record, ahead of their visit to Dundee on June 16. 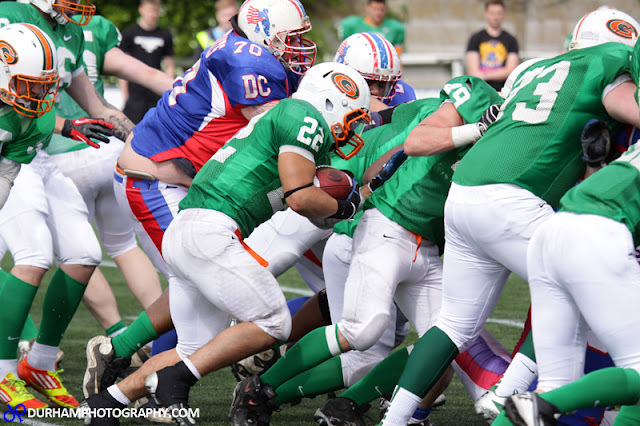 DC will try to bounce back with a home match against the Clyde Valley Blackhawks this Sunday.